My 7 year old son is wearing the costume, we found pictures online of an adult wearing this costume and thought it was a great idea but there were no instructions so we gave it our best shot! I took a pair of elastic waisted pants and a shirt both about a size too big and covered them with duct tape. Then I used cheap green spray pant to give it that green plastic look. I found rain boots at goodwill and spray painted those green. We also found a "safari" costume hat which when spray painted made a perfect army helmet. We covered cardboard in duct tape and spray painted it for the stand. 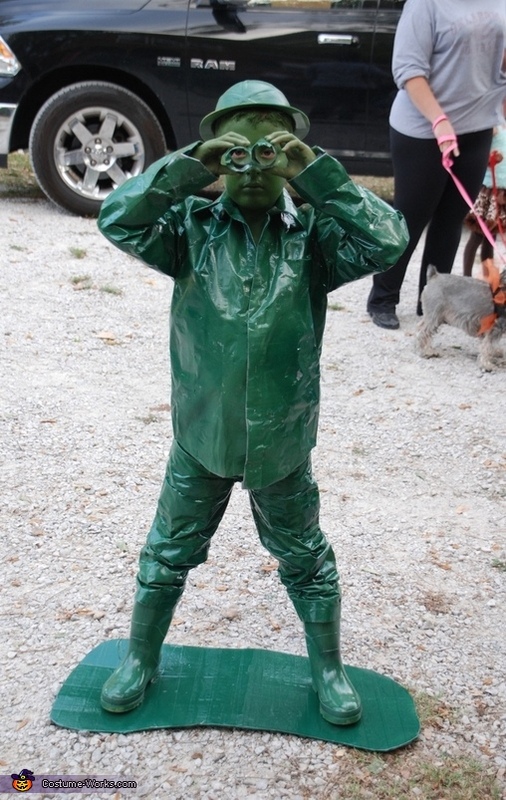 (we did not attach it to his feet although you could atatch it to one foot or cut it in half and atatch it to each foot) we opted to be the plastic army man with binocculars which we made out of toilet paper rolls, duct tape and spray paint. other than that we used green paint from the halloween aisle to paint the face neck and hands. This is so perfect, I'm going to use this idea for a Halloween costume contest. Thank you so much!